Sony has now released what is the second "official" trailer, but what is the third overall if you count that teaser trailer anyone unfamiliar with the fact a Venom movie was being made would still be unfamiliar with that fact after seeing that teaser. It's been difficult to be optimistic about a solo Venom movie since the get-go even with the casting of credible talents like Tom Hardy, Michelle Williams, and Riz Ahmed. Sony was smart in waiting to release a new trailer that likely contains a lot of what the Comic-Con audience saw until after all the Comic-Con hype had mostly calmed down as this thing would have most certainly got lost in the shuffle among all the DC trailers (never thought I'd write that sentence). And while this latest and presumably final trailer for director Ruben Fleischer's (who hasn't made a solid film since his feature debut, but indeed made a hell of a debut with Zombieland) anti-hero movie is definitely the best one yet it's still hard to fully get behind this thing. Visually is where it seems to have the most trouble. The CGI in many places continues to look iffy and we can only hope this isn't the finished product, but given we're less than three months away from release it's difficult to not be skeptical. I'm not saying it looks X-Men Origins: Wolverine bad, but it definitely doesn't look convincing. We could have a similar situation to Green Lantern here where the unfinished effects in the trailer cause people to not show up for the finished product even if there is some improvement in the final product. There's also this hazy hue hanging over everything that makes the film look as if it were shot in 2002 which is to say the movie already looks dated and if your movie that features a completely CGI creature already looks dated before it comes out you might be in trouble. How some films can look so effortlessly real while relying on gobs of CG (see both Guardians of the Galaxy movies) while others seem to be limping to the finish line with their climactic computer generated battle (see Black Panther) I'm not sure, but this is a movie that needed more attention paid to the special effects than it did craft services and while I wasn't on set I'm willing to bet those spreads were more aesthetically pleasing. The story seems familiar enough if you know the arc of Eddie Brock and despite all my pessimism I still hope this turns out well-for all involved and for fans of the character, but I can't help but to feel the writing is on the wall. Venom also stars Woody Harrelson, Jenny Slate, Marcella Bragio, Michelle Lee, Scott Haze, Reid Scott, and opens October 5th, 2018. 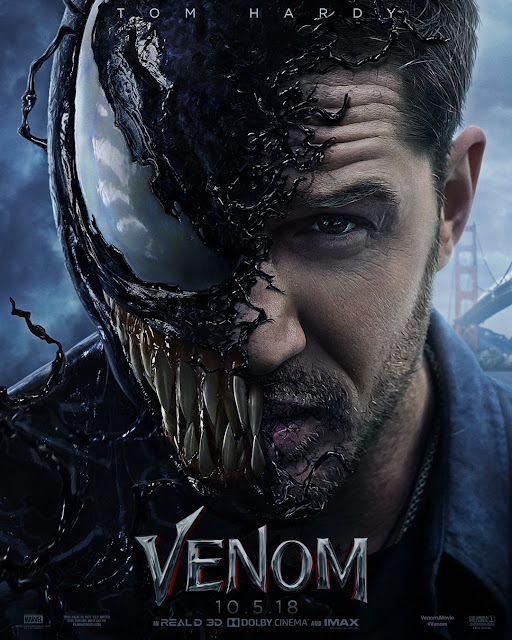 Synopsis: One of Marvel’s most enigmatic, complex and badass characters comes to the big screen, starring Academy Award-nominated actor Tom Hardy as the lethal protector Venom.